The Cotswold Canals In Pictures website illustrates the Stroudwater Navigation and Thames & Severn Canal through some 900+ photographs. These show the restoration progress, surviving structures, obstructions to navigation and other points of interest where access to the canals has been possible. 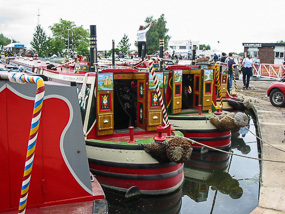 In addition, there are a number of articles about various aspects of the canals and their history. Richard Lord for the giving permission for CCiP to publish a collection of his c1960s photos. Ken Bailey for the aerial photographs of the Phase 1B canal restoration route. Richard Fairhurst for allowing the Cotswold Canals map to be reproduced on this site. The owners of Lock Cottage (Framilode), Kempsford Wharfhouse & 'Blue House' (near Ewen) for their kind permission in allowing photographs to be taken on their property for this website. Charles Lyne, Ken Burgin and Tom Lee for contributing photos. If you have any comments about the site, or the Cotswold Canals in general, then please feel free to contact us here.